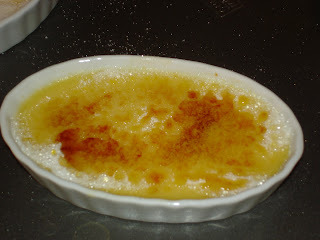 I have always enjoyed eating crème brulee in restaurants, but never really thought about making my own. As a kid I loved ordering it when my family went out for dinner and always considered it a special treat since it was something that we never made at home. Recently, I discovered that it is quite inexpensive to purchase a small crème brulee torch that can be used in preparing crème brulee in your own kitchen. It is actually very easy, and, if you follow the instructions carefully, safe. The end result was a professional looking (and tasting) crème brulee. I purchased a crème brulee set, manufactured by Bonjour , containing a small brulee torch and four crème brulee dishes from the online cooking website, Sur La Table, which is an excellent site for purchasing any kind of cooking or baking equipment and accessories. The set cost about $40 dollars. Unfortunately, I didn’t realize at the time of purchase that the torch did not come with fuel, and had to locate a butane source at the last minute. After a bit of research and some suggestions from my Facebook friends, I learned that this can be found at either a hardware or a good cooking store. Unfortunately, the first hardware store I went to was closed today, so I went to Tarzian West, an excellent neighborhood cooking store here in Park Slope and purchased an aerosol can of butane for about $3.99 that I used to fill my brulee torch. My neighbor kindly offered to let me use his brulee torch (which turned out to be a much larger propane torch, nearly the size of a fire extinguisher). However, my husband and I were more comfortable using the smaller torch that we had purchased. I am sure there are many recipes for different flavors of crème brulee, but tonight, since it was my first time making it, I followed the traditional recipe for crème brulee that came with the Bonjour packaging materials. This is enough to make 4 crème brulee desserts, although you could certainly double or triple the recipe if you were having a crème brulee party. First, preheat the oven to 300 F and prepare a large pot of boiling water. While the water is heating up, combine the 3 T of sugar with the cream over medium heat and stir until small bubbles appear around the edges of the pan, about 5-6 minutes. Next, beat the egg yolks (after separating out and discarding the white portion) with the vanilla until smooth and slowly add the hot cream mixture, beating until blended. Strain in a sieve and divide among the four 4 oz dishes. Arrange the crème brulee dishes in a broiling pan and add the boiling water to the pan so that it is leveled about halfway up the sides of the dishes. Bake at 300 F for about 25 minutes, until the custard is just set. The chill in the refrigerator for about 2-3 hours. Next, sprinkle the remaining 1/3 of a cup of sugar on each brulee on the surface (the sugar will be caramelized with the torch). I used about 1 T for each brulee, distributed evenly on the surface of the ramekin dish. 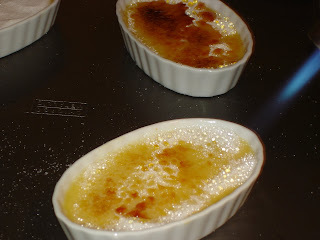 Using the brulee torch, move the flame continuously across the surface of the ramekin using a circular motion until all of the sugar is caramelized and golden brown (but not burnt). You should carefully read the instructions on how to properly use your torch before doing this, though. Once we had located the fuel, the Bonjour torch worked well and was easy to use. 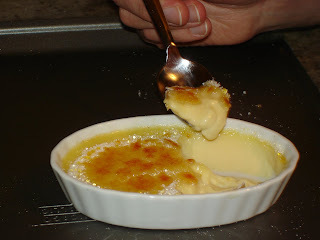 The photo below shows the creme brulee about halfway through the torching process. This dish is so easy to make, yet impressive and spectacular looking (and fun to make) that this makes an excellent dish for a party (as a friend of mine in California suggested) where each guest can use the torch to prepare their own crème brulee. I plan on having a crème brulee party at some point in the very near future! The end result looked and tasted delicious – I highly recommend investing in a crème brulee kit and trying this out at home. I’m certainly glad I did! You could serve it on its own, or with a side of fresh berries or other seasonal fruits. Perhaps most noticable about this recipe is the quality of the custard. Getting the hard sugar coating on top turned out to be the easy part, but getting the custard right is crucial to the success of this dessert.